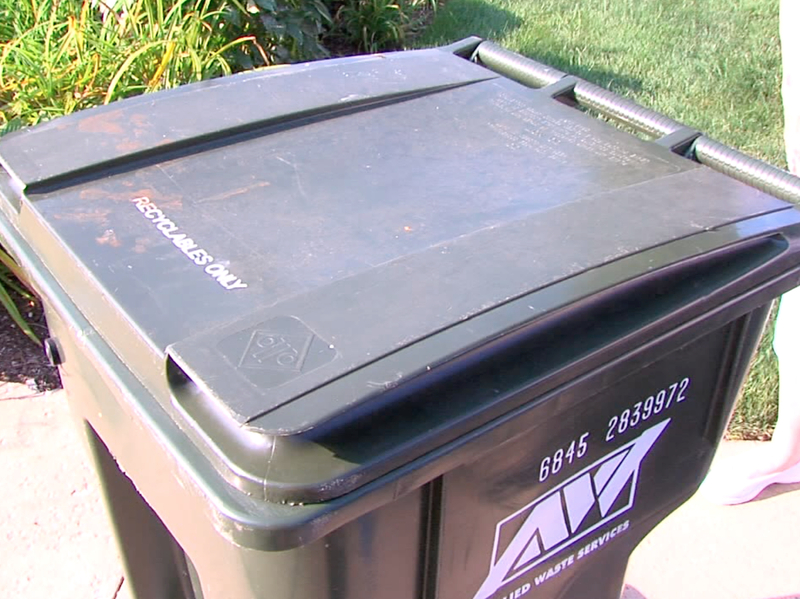 Some Avon residents are now turning in their recycling bins, upset with new higher fees for recycling, recently imposed by Republic Services. Avon residents are now being charged an additional $7.02 on every quarterly bill, after Republic Services said it needed to cover increasing costs at its northeast Ohio facility. The company told News 5, one in every four items being placed in the recycling bin shouldn't be there, and that growing problems with recycling accuracy on the part of homeowners is an issue across the country. However, Avon residents who recycle, like Dee Burton, believe they are unfairly penalized for trying to do the right thing for the environment. Burton said some of her neighbors are now giving up recycling completely. "So they are undoing all that we’ve been trying to do for the environment," Burton said. "It’s making me sick thinking about it." "The people who are recycling are being punished, but the people who were putting all the trash together and aren't helping with the environment, they are being rewarded, they don’t get an increase in their bill." Avon Mayor Bryan Jensen said Republic Service could have done a better job in communicating information about the recycling price hike to his community. Jensen said he's asking the company to re-evaluate the price increase. "Avon is one of the better recycling communities in the county, and how good were doing, but now they say it’s dirty recycling," Jensen said. "They are the only hauler in the city, and you feel like you’ve been taken advantage of, there is no way you can't feel that way." "Contamination has become rampant through our local recycling programs. We are seeing on average about 30% contamination rates in residential recycling. And in some cases, much higher. That means one in four items a consumer puts into their recycling container at home is not recyclable. Examples of items that are not recyclable include diapers, plastic grocery bags, yard waste and food waste. This problem was recently compounded by China’s decision to impose new acceptance criteria, effectively eliminating end-markets for many recyclers. These factors have reached a crisis point and they jeopardize the future of our local recycling programs. We want to encourage the local residents to continue to recycle. This is critically important. We also realize they are asked to pay more for recycling, but we believe it’s worth the investment to help keep these local programs going." Meanwhile, Republic Services has now launched a recycling information website in recent weeks, in response to growing recycling issues.